Any DMX input signal can be used to control MADRIX remotely. While you can use preconfigured DMX protocols, you can also set up such a configuration according to your needs with the help of the DMX-IN Remote Editor. This topic describes how to use the DMX-IN Remote Editor. ▪ Make sure to configure your DMX device first. ▪ Set up DMX Input. ▪ If you are creating a new DMX protocol, the list will be empty. ▪ If you are modifying an existing DMX protocol map, the list will already contain all preconfigured settings. New - Creates a new configuration while deleting all previous list items with your permission. - Allows you to create an empty DMX Remote Configuration [Empty] or load a preconfigured DMX protocol [Simple, General, Advanced]. Open - Loads a previously saved DMX Remote Configuration file into the DMX-In Remote Editor from an external file [of the file type *.mdrx]. Save - Saves the current DMX Remote Configuration to an external file [of the file type *.mdrx]. Save As - Save the current DMX Remote Configuration to another external file [of the file type *.mdrx]. Simply enter a name and click Save. Assign - Allows you to assign a control of your DMX controller to a function in MADRIX. 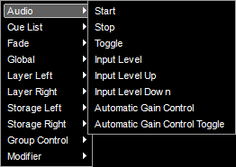 - 1] Activate Assign, select an list item you created and move the control of your DMX controller. Test - Allows you to test single list items and their functionality on the MADRIX user interface, while having the DMX-IN Remote Editor still opened. - Activate Test, then use the control on your DMX controller. You can see if the control works as expected on the MADRIX user interface. - If Test is activated, MADRIX will receive the signal directly and not the DMX-IN Remote Editor. Configuration Name - Allows you to type in an individual description for your DMX Remote Configuration. - Once saved, you will be able to select your DMX Remote Configuration under Preferences > Device Manager... > MIDI > Remote Control and MADRIX will use this label. ▪ Each list item represents 1 DMX remote functionality using 1 DMX control [i.e., button, fader, etc.]. A] Click Assign, select a list item and use a control on your DMX controller. In most cases, MADRIX will automatically recognize the DMX Channel, Control Type, and Interaction. B] Or first select a list item and perform a double-click with your mouse on the column DMX Channel. Second, enter the correct DMX channel [e.g., CH01 for channel 01]. B] Or first select a list item and perform a double-click with your mouse on the column Control Type. Second, select the type of the control of your DMX controller [e.g., Button]. Toggle - Defines that the Control Type only has two states [On or Off]. Is usually used for Button. Absolute - Defines that the Control Type uses all available values [e.g., 0 to 255]. Is usually used for Fader / Knob. ▪ Select an item and perform a double-click with your mouse on the column MIN, MAX, or Description. Enter the desired value or text. MAX - Defines requires a maximum value for this functionality. - For example, the Master Fader has a maximum value of 255, or you may want to set the maximum Fade Time to 10 seconds. 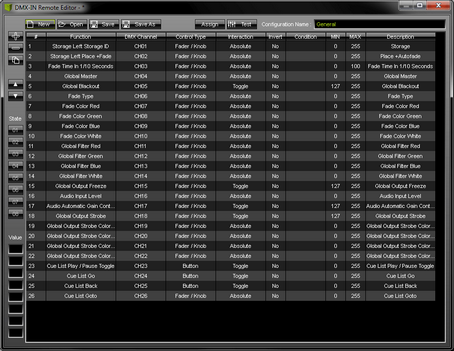 The DMX-IN Remote Editor allows you to create advanced DMX configurations. - List item 1 defines a button as a Modifier, State 1 to be toggled. When pressed, State 1 is active [On, Yes]. When not pressed, State 1 is not active [Off, No] . ▪ Valid values range from 0 to 255. - Your DMX controller may only have 2 faders. - But you would want to control the Master, the Speed Master Left, and the Speed Master Right with these two faders. - In this example, we have configured the first fader to activate three different configurations for the second fader. - If fader 1 is set to 0, the second fader will act as the Master. - If fader 1 is set to 127, the second fader will act as Speed Master Left. - If fader 1 is set to 255, the second fader will act as Speed Master Right. - Depending on how the first fader is set up, the modifier value changes from 0 to 255. MADRIX checks this value and allows the fader to control the corresponding function on the MADRIX user interface. ▪ When Test is activated, MADRIX shows the status of a Value in the DMX-IN Remote Editor. ▪ You wish to use single buttons of your DMX controller for each Storage Place.